Download One or All of the Guides Below! 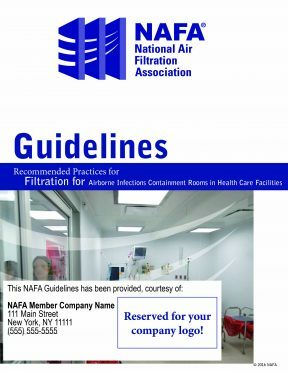 These best practice guidelines establish criteria for using air filtration in the removal of airborne infectious pathogens from hospital containment rooms for the purpose of protecting staff, patients and visitors from nosocomial infections. These best practice guidelines establish air filtration guidelines for the removal of particulate contamination for the protection of the air handling equipment and components, as well as providing comfort and a healthy environment for all who work, visit, live and play in these facilities. The recommendations in this guideline are considered by NAFA to be “best practice” in contrast to “minimum standards” as put forth by other organizations. It will serve to provide owners and facility managers with the necessary information to make educated decisions when providing filtration products for their building, and an essential component of their Indoor Air Quality (IAQ) and life safety program. These best practice guidelines establish air filtration guidelines for the removal of airborne contaminants for the protection of employees and participants in indoor firing ranges. These best practice guidelines establish criteria for the removal of particulate and molecular contaminants (please refer to NAFA Guidelines for Molecular Filtration) for the improvement of indoor air quality and protection of HVAC equipment in Higher Education facilities. It serves to provide the facility managers with the necessary tools to make measurable differences to the operation of HVAC systems in their campus through air filtration. These best practice guidelines establish criteria for the removal of particulate and gaseous contaminants for the protection and long-term preservation of historical documents and artifacts. The recommendations in this guideline are considered by NAFA to be “best practice” in contrast to “minimum standards” put forth by other organizations. They serve to provide the conscientious Facility Manager with the necessary guidelines to make measurable differences of air quality in his/her building. Esta mejor práctica recomendada establece pautas de filtración de aire para la eliminación de partículas y contaminantes gaseosos para la protección y preservación a largo plazo de documentos históricos y artefactos. NAFA considera que las recomendaciones en esta guía son “mejores prácticas” en contraste con los “estándares mínimos” establecidos por otras organizaciones. Sirven para proporcionar al responsable de la instalación concienzudo las pautas necesarias para establecer diferencias mensurables de la calidad del aire en su edificio. These best practice guidelines are designed to provide a general overview of how best to apply molecular filtration in HVAC applications where the need to remove gaseous airborne contaminants exists. These best practice guidelines establish criteria for the removal of particulate and molecular contaminants for the improvement of indoor air quality and protection of HVAC equipment in K-12 schools. It serves to provide the facility managers with the necessary tools to make measurable differences to the operation of the HVAC systems in their campus through air filtration. These best practice guidelines establish air filtration and spray collection guidelines for the removal of airborne contaminants for the protection of the employees, equipment, and environment in commercial and industrial spray booths. These best practice guidelines establish criteria or the removal of particulate and gaseous contaminants from the immediate breathing zone of employees engaged in the process of welding. Filtration guidelines for general ventilation, when applicable, are also addressed.